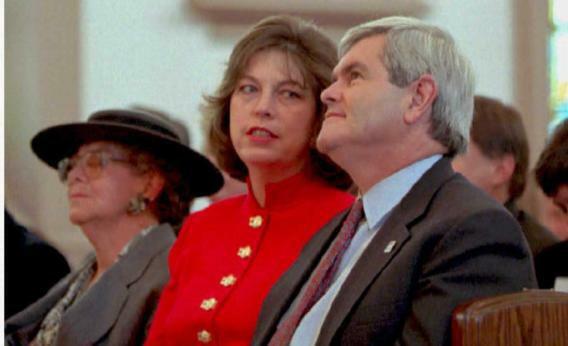 Marianne Gingrich nightline interview: Could Newt's ex really ruin his chances? Could Newt Gingrich’s Desire for an Open Marriage Really Ruin His Chances? Newt Gingrich sits with his ex-wife, Marianne and his mother, Kathleen. Newt Gingrich’s second ex-wife, Marianne, is giving a bombshell interview on ABC’s Nightline tonight. Marianne gave a dishy, fabulous interview to Esquire about a year and a half ago, so it’s unclear what new dirt she will reveal about her ex-husband. Some conservative commentators are claiming that ABC is deliberately airing the Marianne interview ahead of the South Carolina primary in order to ruin Newt’s chances at the GOP nomination just as he’s “getting close to upsetting the Romney apple cart.” Indeed, Newt has momentum. But Marianne’s going to have to say something truly inflammatory for it to make a difference to Newt enthusiasts, beyond the fact that Newt wanted an open marriage, which is what Nightline is showing in its preview of the interview. Marianne’s interview may even have a positive effect on South Carolina voters. They may see her as a bitter woman who’s just attempting revenge-by-network news, and this may galvanize their wavering support for Newt. They may not even believe whatever Marianne has to say. Unless Marianne has photographic evidence of Newt drop kicking several puppies and then peeing on Ronald Reagan’s headstone, I don’t think the interview will make much of a difference.